VW Chairman Now Included In German Prosecutor's Volkswagen Emissions Probe : The Two-Way The news comes more than one year after Hans Dieter Pötsch was named chairman; for 12 years, he was Volkswagen's chief financial officer. 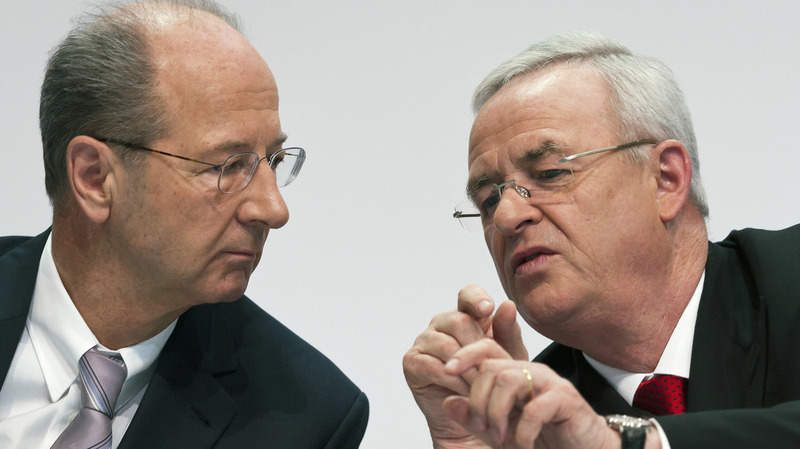 VW Chairman Hans Dieter Pötsch, left, seen here with his predecessor Martin Winterkorn, has been at Volkswagen since 2003. The public prosecutor's office looking into Volkswagen's diesel emissions scandal in Germany has widened the investigation to include Chairman Hans Dieter Pötsch, who was VW's chief financial officer when its cars were built to fool emissions tests. The news comes more than one year after Pötsch was named chairman; last December, he acknowledged that the emissions cheating had stemmed from a "chain of errors" in the company rather than from the actions of a group of rogue engineers. Pötsch was Volkswagen's chief financial officer from 2003 to 2015 — a period that encapsulates the company's development of cheating devices that could fool U.S. emissions tests on diesel engines. The Environmental Protection Agency's list of affected model years runs from 2009 to 2015. Volkswagen announced the new development Sunday, saying that despite the Braunschweig public prosecutor's move, the company "reaffirms its belief that the Volkswagen Board of Management duly fulfilled its disclosure obligation under German capital markets law."